The following is provided as information only – not as tax advice. Please consult a tax professional. 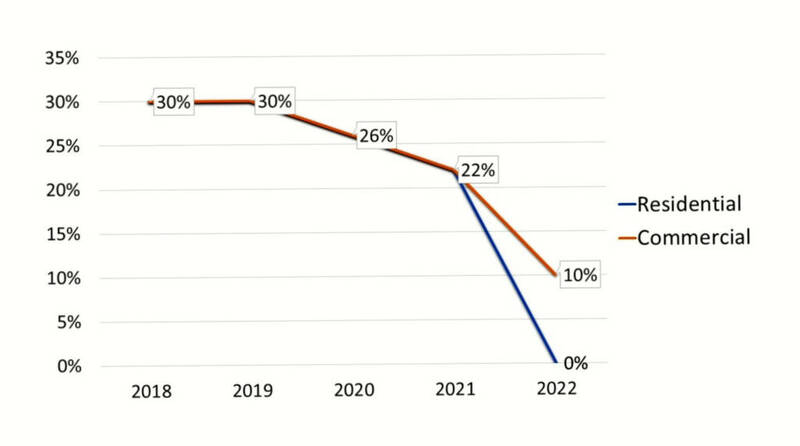 30% credit level for systems on which construction has begun before the end of 2019; 26% in 2020; 22% in 2021; 10% in 2022; and residential credit will be eliminated and 10% for commercial in and after 2023. The credit steps down in value over the next few years. It will disappear completely for residential customers in 2022. In the short term, until the end of 2019, the forthcoming decrease will encourage future system owners to act quickly to take advantage of the highest possible tax credit. Therefore, the industry demand will be increased for solar equipment and labor, mainly in the busy Q4 months. Because of this, we encourage all clients to lock down this opportunity so we can secure the equipment needs for all of you who are ready to maximize your ROI as soon as possible. Claim credit by completing IRS forms 1040 and 5695 (please consult tax professional). You can read more @ SEIA here. Make a simple and quick check with a free estimate on any home improvement project and see if you qualify here.